Since then, I’ve learned a ton more about Faraday cages, and experimented a lot to make an even BETTER box. It turns out that my original box was only so-so at blocking Bluetooth. My original testing of Bluetooth blocking was, shall we say, not very thorough. My primary focus was blocking cell network signals. I also mistakenly assumed that if Bluetooth was blocked, WiFi at 2.4 GHz would also be blocked. Nope! WiFi is much harder to block due to the higher signal strength (among other things). To make matters worse, contrary to popular belief, we’re still learning about how Faraday cages actually work! One thing to keep in mind is that for some people, a simple cookie tin or wrapping the phone in aluminum foil will do. But – and this is a BIG but – it really depends. What phone? What signal strengths are we talking about? How close is the transmitter you’re connecting to? What WiFi band are you using? How good are the seals on your box (conductivity-wise)? Faraday cages never actually “block” signals – they simply attenuate (or weaken) those signals. Thus, what works for one person may not work for another. This is why Faraday bag manufacturers report numbers like “80dB of attenuation” or “100dB attenuation!”. You may even find that you can buy a $99 Faraday bag, stick your phone inside, and if you’re standing too close to whatever antenna, oops! It doesn’t block the signal. It’s a tricky business, and it’s a lot more complicated than just: foil = works. So, you’re gonna have to test things for yourself! This box was VERY thoroughly tested, but with my Nexus 5X phone, my Bluetooth accessories, and the very good 2.4 GHz Intel WiFi in my high-end laptop. 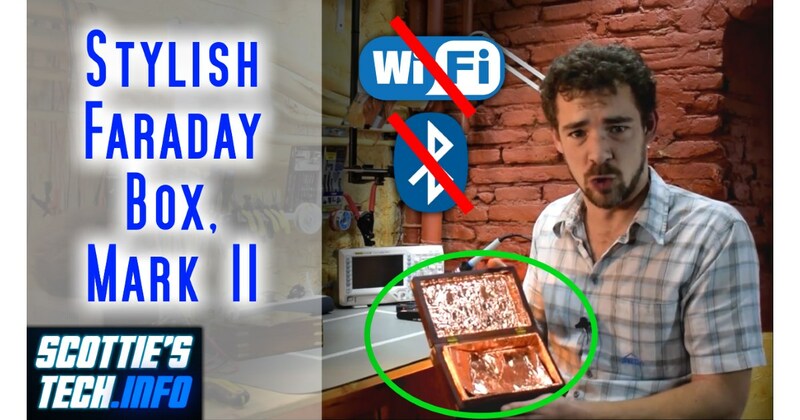 Also, you do NOT need to ground a Faraday cage/box. I did all my testing for this new box twice: with and without ground. The ground made no difference. Usually, pro Faraday cages are grounded for reasons other than increased shielding, because grounding is not necessary. The redistribution of electrical charge in the metal of the Faraday cage is what’s important. As for copper tape vs aluminum tape, the key here is not the conductivity between copper and aluminum. The key is that the copper tape has conductive adhesive. That way, you end up with a nice continuously conductive metal shell. Someone even asked about gold. Copper is a better conductor than gold! Cheaper, too. Gold is usually used for connectors mostly because it’s a marketing gimmick, although it does prevent corrosion better than copper. 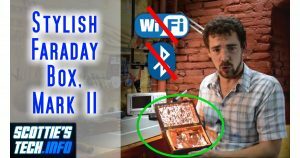 Finally, the equipment needed to thoroughly and properly test a Faraday cage is beyond most of our budgets, so the simple alternative is to test, test, test for your specific gizmos and situation! If I wrapped a fitted sheet and a blanket with this copper tape, would I be (sorta) safe from all the wifi cooking me in my apartment block? Or would I need to go full burrito with a sleeping bag? LOL! You’d need to go Full Burrito… possibly double-burrito. Mesh with teeny holes would be better though so you can breathe.